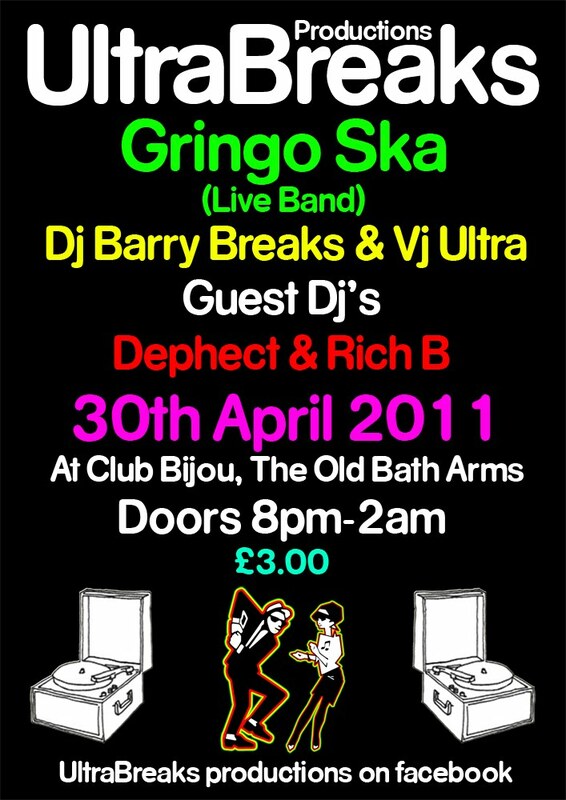 Following a massive start to 2011 we're back with another night of Funky Big Beats at what is fast becoming known as the HEAVIEST night in Frome! 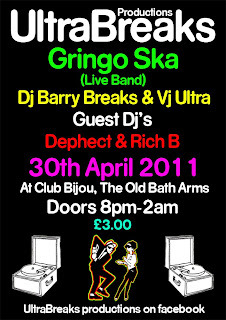 Tonights special guests are the legendary GRINGO SKA, who'll be playing a pre-festival live-set of ROCKSTEADY, CALYPSO and JAZZ with their distinctive SKANKING sound....anyone who has seen the 'Gringo's can testify, the RHYTHMS are just too irresistible to ignore, the tunes too sweet - it's the music of people having a GREAT TIME! With residents DJ BARRY BREAKS & VJ ULTRA joined on the night by DJ's DEPHECT & RICH B on the decks spinning the FUNKIEST funky FUNK WOBBLERS through to rolling DRUM & BASS, this night is all about BIG SOUNDS, BIG VISUALS and a BIG SYSTEM! Get on down there early, because we'll be rockin' socks from the start!